�@　We have completed main canal thorough out 25.5 km (1.3km is added at the end.) The opening ceremony was held on 8 February, 2010, attended by the main members of Nangarhar Government and Japanese representatives. However, still many repair works and appurtenant work remained, continuing our work for another 7 years. �A　The main drainage from Gamberi Dessert to Kunal River is still under construction. �B　From January to June 2010, 96,425 trees were planted. 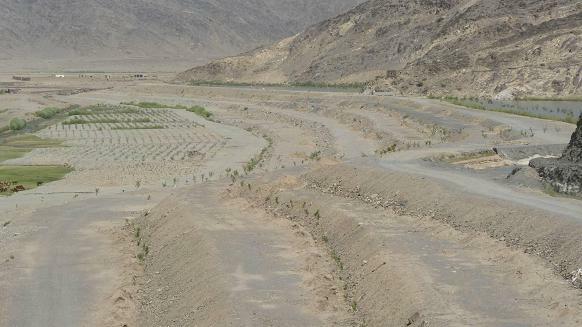 Total number of planted trees became over 400,000 along whole canal by the end of June 2010, although more than half of them requires watering still now. ＊	The details are on attached progress report. 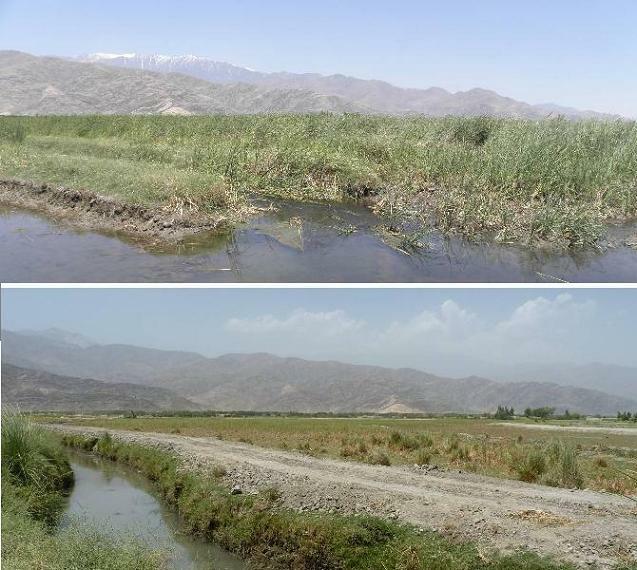 PMS emergently started construction of Kama Inlets by requests of Irrigation Department on 14 December 2008, for its main two canals had dried up since November 2008. The construction of the first inlet has been completed on 15 February, 2009. We carried out repair works in January and February 2010. Regarding as the second gate, temporary repair was done from January to March in 2010. Now they are under observation to look into the condition in summer season. PMS is planning to complete the second water gate as well as some repair work of first one in this coming winter. 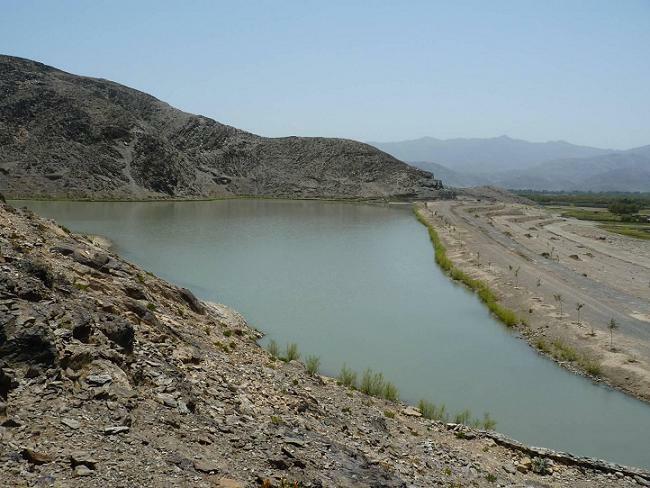 The previous pilot farm of PMS was shifted down from Dara-e Noor to upper Shigi (Gamberi) because of security problem in 2009. It has started again with larger scaled manner after bringing water by Marwarid Canal. Rapeseed and alfalfa were seeded as green manure several hectares from Feb. to April in 2010, followed by growing water melon, peanuts, rice, cotton and corn at total 22 hectares by the end of June 2010. Construction of District Madrassa was started in March 2008, PMS has completed main components (mosque and class rooms) by the end of January 2010, handed over to proper authority on 8 February 2010. Now construction of dormitory is going on. The largest reservoir in the canal ( Zone Q2, around 20km from the inlet)　with length 330m, width 200m. Zone Q2 & Q3. View from upper side. The long embankment has ; height 8-17m, length 900m, width of base 50-160m. Drain work at lower steps. 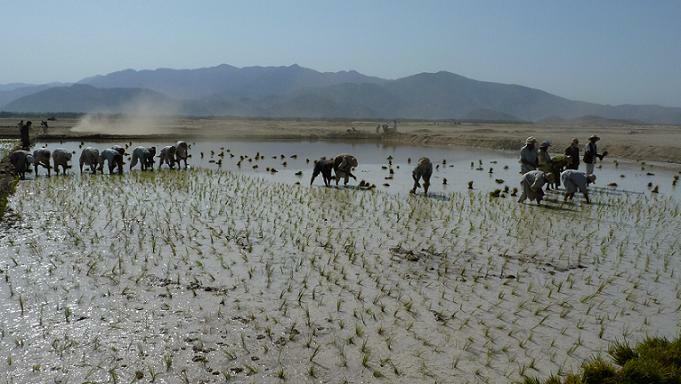 Planting rice at Gamberi Desert ( 22 June 2010) 2 hectares is used for rice field in 2010. Comparison study about amount of crop with several species shall be done as a trial in this year. 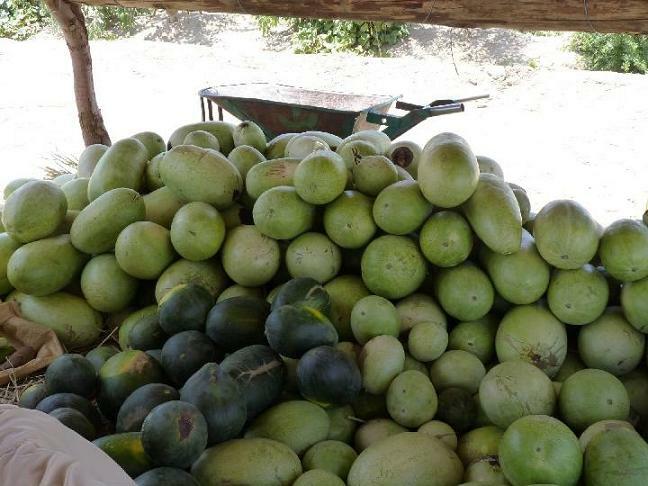 Water Melon Product. Several kinds of seeds have been compared. 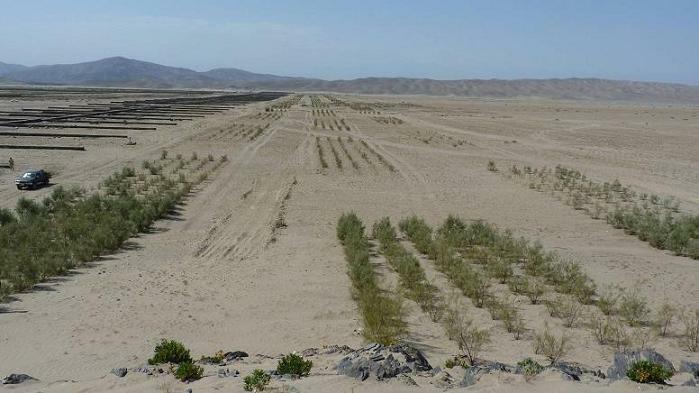 Growing gaz(red willow) forest against sandy wind and heat at Gamberi Desert. Total area of gaz trees is 5.5km in length, 50-100m in width. Change of wet land. Dredging work was dramatically effective, sweeping away whole wet land in one year. Wet damage is almost over. 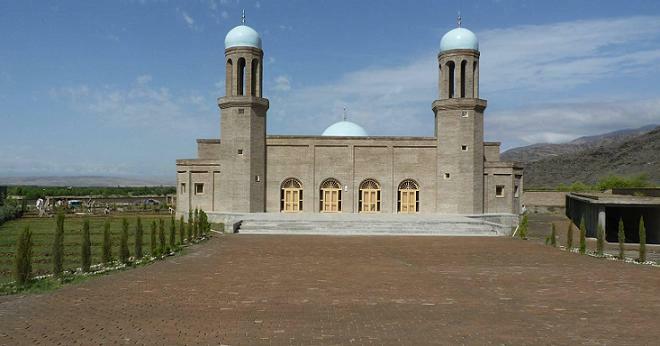 Front view of the mosque. Handed over to the authority on 8 February 2010. Now we are developing the garden surrounding place. Kama Inlets in flood. The highest HWL was recorded on 22 July 2010. Although serious damage did not happen, PMS is planning to radical repair work in winter season.